Valve gave classic Counter-Strike map de_train a makeover in this week's update (and thank goodness—it needed it). The overhaul to the map's layout and look has mostly been well-received—the new Train has a high-contrast look and a less complicated A bombsite. But one new map element that Valve snuck in has already been removed: vile, map-unbalancing birds. Not long after Train updated, players discovered that they could jump atop the pigeons that were placed along the long route to A from Terrorist spawn (aka "ivy") and pigeon-piggyback into the heavens, blissfully escaping the horrors of combat. Or, as the video below shows, players could use the pigeons as a flapping platform to glitch into the rooftops overlooking bombsite A, giving them a huge advantage over the CTs. 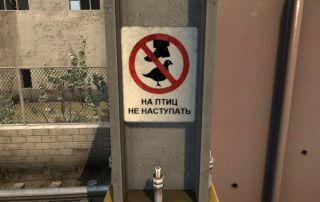 Valve has hotfixed the foul fowl play, but the current version of Train pays homage to this "bird boost," as it came to be known, with a new sign along the way to where it was once possible. Immortal words that should inspire us all.